What connects Edinburgh, forensic medicine, public health and Sherlock Holmes? Many people would be tempted to say ‘Joseph Bell’, although they would probably wonder where public health fitted in. The answer is in fact ‘Henry Duncan Littlejohn’. Born in 1826, the son of a prosperous merchant, Littlejohn was also credited by Conan Doyle as having been an influence. He graduated from the University of Edinburgh in 1847 and became a Fellow of the Royal College of Surgeons in 1854. The same year saw him take up the position with Edinburgh Town Council as Police Surgeon. In 1862 he was appointed Edinburgh’s first Medical Officer of Health. The work he undertook had a significant impact on reducing the frequency of outbreaks of smallpox and typhus. He was President of the Royal College of Surgeons of Edinburgh (1875-6), of the Medico-Chirurgical Society of Edinburgh (1883-5), and of the Institute of Public Health (1893). Awarded an honorary degree by the University of Edinburgh in 1893, he was knighted two years later. Littlejohn was appointed to the Chair of Medical Jurisprudence at the University of Edinburgh in 1897. 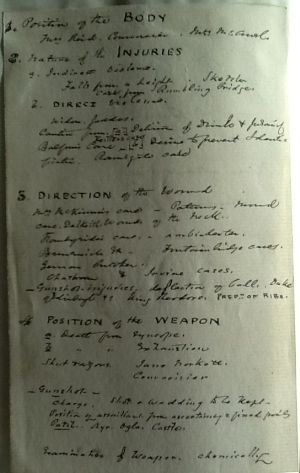 In the context of that post, a series of his notebooks were kept by his successors within the departmental records of the Forensic Medicine department. However when these arrived in the University Archives volume “Wounds II” was noted as being absent. Thanks to the vigilance of a member of academic staff, this missing volume has now been found and transferred to us. Enclosed in the third volume are (1) Examination script and (2) Letter about ‘meat pies’ from a student of Henry Duncan Littlejohn. Enclosed in the fourth volume is booklet A Case of Strychnia Poisoning by J. Allan Gray, Medical Officer of Health, Leith. The ‘new’ volume is of a similar format to the others with notes, news cuttings and loose enclosures. 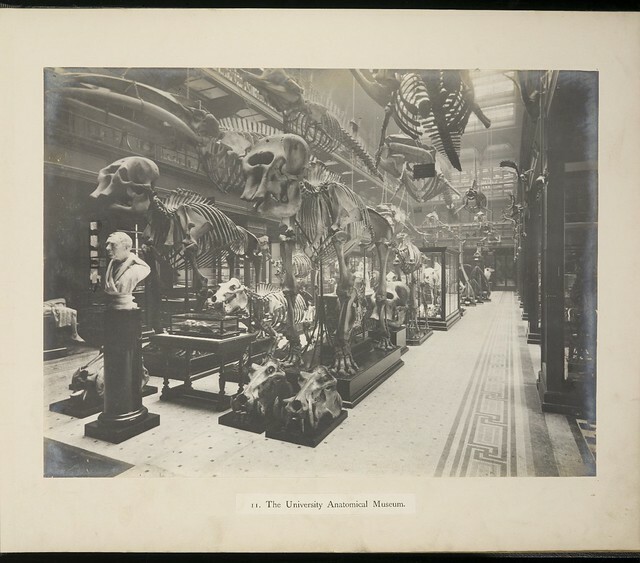 This entry was posted in Uncategorized and tagged Forensic medicine, Henry Duncan Littlejohn on 13/03/2013 by Archivists.